Talk about a blessed man! It started last Sunday morning. The 'work' of hard fishing conditions of wind and choppy waters subsided and turned the Mississippi Delta into a pristine lake. As we went out into the reeds, it was as beautiful a sunrise as I had ever seen. And the redfish were hungry! All I can say is that we caught fish from 7Am until 1:30 PM - we pulled one in about 3 or 4 casts. Every spot produced some kind of nice catch. A lot of reds, but we also caught a big speck, a founder, a blue fish, a freshwater cat, and two monster Jack-cavelles. 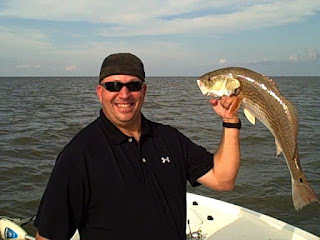 I still cannot express the fun of having a redfish attack your lure- they hit it hard- they come to put a hurt on you! But as sweet as that was... 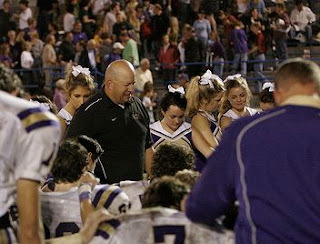 I still find unbelievable satisfaction in coaching my football team. My team really picked me up this week- we had fun practices in the mud and it paid off with a very special win at DCA last night. We have beaten our #1 rival now 5 years in a row... and it never gets old. We just played really well and pushed a close halftime game into a relatively comfortable 4th quarter win. I received so many texts, e-mails, and phone calls about how proud people are in our effort. I am so happy and so thankful.